UN Operational Support recognizes the potential damage that field operations can have on the environment, as well as on the local economy and on relations with host communities. As a result, we have significantly increased our focus on environmental management and have established it as one of our top priorities. We strive to deploy responsible missions that achieve maximum efficiency in their use of natural resources and operate at minimum risk to people, societies and ecosystems, contributing to a positive impact on these wherever possible. 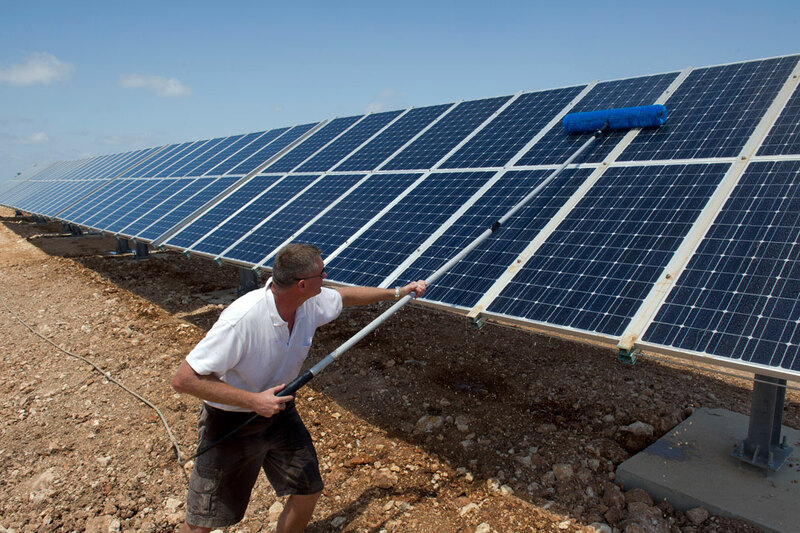 UN Photo/Pasqual GorrizSolar farmer working with the UN Interim Force in Lebanon (UNIFIL) cleans a row of solar panels of UNIFIL’s facilities in Naqoura, Lebanon. The urgent deployment of thousands of civilian, police and military personnel requires a very large amount of logistical support. Often peacekeeping personnel operate in the world’s hardest-to-reach places and in countries with very little infrastructure. This requires most peace operations to generate their own power and use a fleet of aircraft to manage logistics, emitting greenhouse gases and potentially causing some soil pollution. At the same time large operations generate a lot of solid waste, require potable and non-potable water and as a result produce wastewater. All of which, if not handled correctly, can have an impact on the environment of the host country. In some areas like Darfur or the North of Mali, where water is a scarce resource, the local community may see the UN mission as a resource competitor. The Department of Operaitonal Support (DOS) recognises this potential damage and as a result have developed jointly with UN Peacekeeping an overarching policy to deal with environmental issues. DOS is actively working towards managing its environmental impact. We launched an Environment Strategy in November 2016. It sets out a vision that DOS will strive to achieve by 2023 in relation to environmental management in peace operations. Click here for more information. Identifying environmental challenges and sharing best practices helps the continuous improvement of our field operations. Click here for more information. UNEP report on "Greening the Blue Helmets"